1) “Why He Kayaked Across the Atlantic at 70 (for the Third Time)” (New York Times Magazine, 26 minutes, March 2018). This is quite the story. When Aleksander Doba kayaked into the port in Le Conquet, France, on Sept. 3, 2017, he had just completed his third — and by far most dangerous — solo trans-Atlantic kayak trip. He was a few days shy of his 71st birthday. He was unaccustomed to wearing pants. He’d been at sea 110 days, alone, having last touched land that May at New Jersey’s Barnegat Bay. The trip could have easily ended five days earlier, when Doba was just a few hundred feet off the British coast. But he had promised himself, when he left New Jersey, that he would kayak not just to Europe but to the Continent proper. So he stayed on the water nearly another week, in the one-meter-wide boat where he’d endured towering waves, in the coffinlike cabin where he spent almost four months not sleeping more than three hours at a stretch, where he severely tried his loved ones’ patience in order to be lonely, naked and afraid. Then he paddled to the French shore. 2) Support Now I Know: As many of you already know, researching, writing, and (save for the daily typo or two) editing Now I Know is a pretty big endeavor on my part. Keeping the project financially sustainable is a battle, and to that end, I’ve tried many different avenues. One of them — a major one at that — is my ongoing Patreon campaign. It’s an old-style patronage campaign, where readers such as yourself support Now I Know through a monthly pledge. 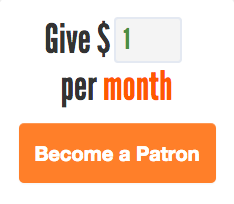 A $5 a month pledge comes out to about 25 cents per article I send; a $1 a month pledge is roughly a nickel. Please consider supporting Now I Know through Patreon by clicking here. It’s entirely optional and you’re under no obligation to do so, so don’t feel bad if you can’t or don’t want to. But if you do, please know it all adds up, and I greatly appreciate your support. Thanks! Monday: The Snowball Fight that Mother Nature Won — Real Snow 1, Fake Snow 0. Tuesday: When the Driver Walks Away — The train trip that ended because the driver decided to leave midway through. Wednesday: Why Tennis Balls Are Yellow — I could tell you why here, but wouldn’t it be more fun to read the article? Thursday: Dropping the Balls — A unique way to keep a reservoir going. 4) “Some people repeatedly win the Wisconsin Lottery. Do they play fair?” (WisconsinWatch.org, 13 minutes, March 2018). I think I recently shared another story about people gaming the lottery. Anyway, this is another good one. 5) “JFK video: hear Kennedy’s ‘lost’ Dallas speech in his own voice” (The Times (UK), 7 minutes, March 2018). You’ll need a free login to read this one. It took eight weeks to bring to life the 2,590 words John F Kennedy never got to speak. Sound engineers pulled 116,777 sound units from 831 of his speeches and radio addresses. These units were then split in half and analysed for pitch and energy. The half units, known as phones, were each about 0.04 seconds long and had to be tested next to each other to ensure that they did not clash. The W sound in “weapons”, for example, is not the same as the W sound in “words”. “There are only 40/45 phones in English so once you’ve got that set you can generate any word in the English language. The problem is that it would not sound natural because one sound merges into the sound next to it so they’re not really independent. You really need the sounds in the context of every other sound and that makes the database big,” Chris Pidcock, co-founder and chief voice engineer at CereProc in Edinburgh, said. 6) “How Two Photographers Unknowingly Shot the Same Millisecond in Time” (Petapixel, 4 minutes, March 2018). An impossible coincidence. It’ll take you more than four minutes to read because you’ll be in awe for at least five.